TORMADA® + Lake Restoration Liquid Products = Pond Weeds and Algae, Gone! Struggling to control pond and lake weeds and algae? Look no further. Lake weed control is simple, easy and fun with our Pond Solutions option. 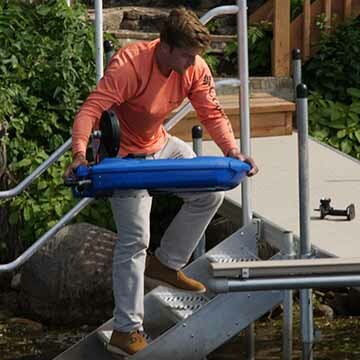 We recommend using our liquid Pond and Dock and Swim products with your TORMADA® application boat. *NOTE: We do not recommend using our pond dyes in the TORMADA®, as it is very concentrated and can be messy. We recommend simply pouring pond dye in your pond, and it will spread throughout the water within a few hours. Use our liquid Pond Solution products in your TORMADA® boat. For more information on the TORMADA® contact us at 763-428-9777 or (toll free: #1-877-428-8898). The TORMADA® is easy to use and lots of fun to drive. Take the chore out of having to treat your pond or dock area for weed and algae. Using a handheld remote you can control the fan speed and direction, and there is no need to mix the products. The TORMADA® will naturally dispense the products until the tank is empty. 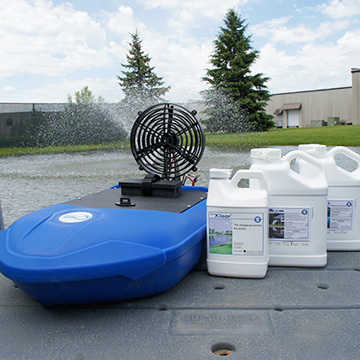 Eliminate the difficult task of using a pond sprayer and safely limit your exposure to products while treating. TORMADA and T2 Series:550 Brushed Motor, 7.2V 6-cell 4600mAh rechargeable NiMH battery (the battery operates for approximately 20 minutes on one charge). 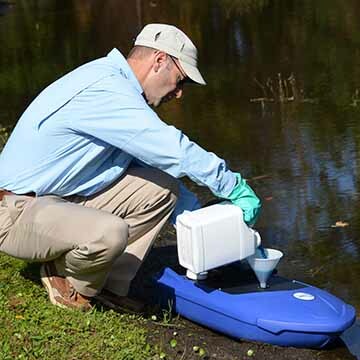 "The TORMADA® took the chore of managing aquatic weeds and algae in my pond, and turned it into an activity that is simple and enjoyable." Worked great! We have a ten acre pond that is chocked with weeds and muck. It took the hassle out of applying the chemicals to combat our water bonnet and lily problem. We tried navigate granules and as two adults that work full time and have two young kids. It took hours to apply and we didn't get it spread evenly. The tormada took minutes and we noticed a real difference in the application area. I have a ranch in Oklahoma with numerous ponds that are hard to access. Some of them are difficult to treat because I would have to launch a boat to make my treatments. With the TORMADA I am now able to treat all of my ponds right from the shore! The TORMADA works great! The Tormada is a must for treating ponds effectively. I could not have done a good job with out it.